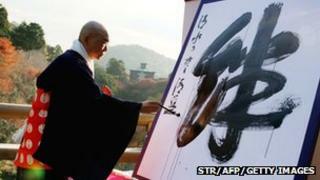 Image caption The chief priest of Kyoto's Kiyomizu temple displays his calligraphy of "kizuna", meaning "bond"
The Japanese word "kizuna", meaning bonds or connections between people, has been chosen as Japan's kanji of 2011. The kanji, or Chinese pictorial script, for "kizuna" emerged top of a public poll for the character that best summed up the year. For Japan, 2011 was dominated by the earthquake and tsunami in March. The disasters led to unprecedented numbers of Japanese helping one another. After the tsunami smashed into Japan's north-east coast on 11 March, killing thousands and engulfing entire communities, people's stoicism and their determination to pull together won international praise. In April the then prime minister Naoto Kan thanked the world for its help in a letter entitled "Kizuna - the Bonds of Friendship". And when Japan unexpectedly beat the United States to win the women's football World Cup, "kizuna" forged by the players' teamwork was cited with pride. Half a million people took part in the annual poll for the kanji character, conducted by Japan's Kanji Aptitude Testing Foundation. About 60,000 people nominated "kizuna", but the runner-up was much less optimistic: "wazawai" means disaster. For some Japanese, 2011 brought the opposite of "kizuna". A firm that specialised in divorce ceremonies said in July that they had tripled since the tsunami as people reassessed their lives.